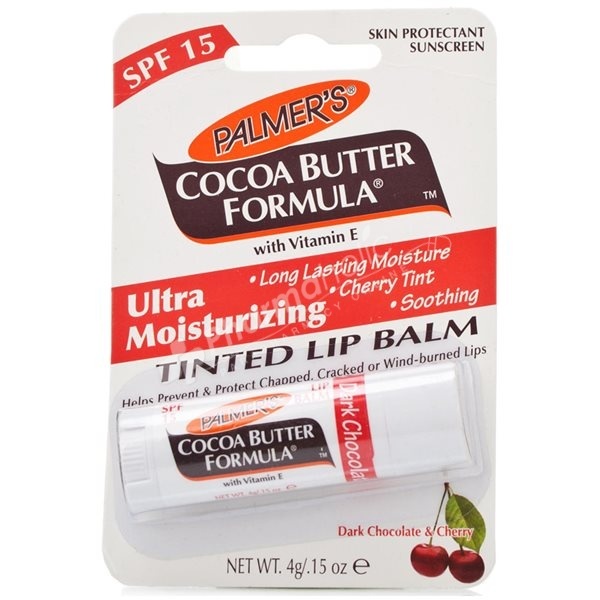 Palmer's Cocoa Butter Formula Moisturizing Lip Balm with SPF 15 helps prevent and protect chapped, cracked or wind-burned lips. Cocoa Butter: a rich, natural moisturizer that leaves skin soft and silky, tranforming even the roughest, driest areas into buttery soft skin. Dimethicone, Octinoxate, Oxybenzone, Mineral Oil (Paraffinum Liquidum), Microcrystalline Wax (Cera Microcristallina), Coppernicia Cerifera (Carnauba) Wax, Theobroma Cacao (Cocoa) Seed Butter, Flavor, Tocopheryl Acetate (Vitamin E Acetate), Red #7 (CI 15850), Mica, Titanium Dioxide, Red #40 Lake (CI 16035), Saccharin, Hydrogenated Polyisobutene, Palmitic Acid.